In 1992, Starbucks operated 154 stores. That’s it. In 1991, it was only 107 Starbucks stores. It’s hard to imagine a Starbucks corporation that small! 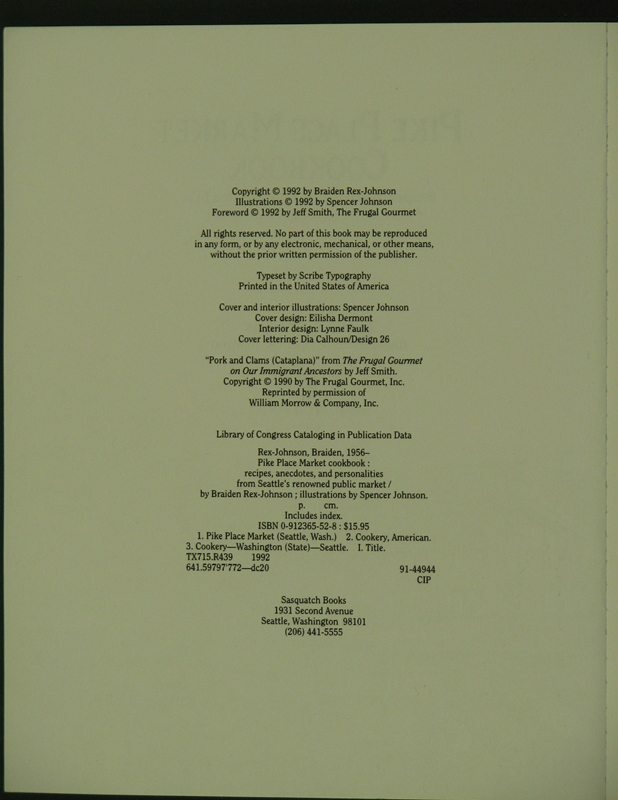 (Well, before June of 1992, they were not a corporation, considering that the initial public offering was in 1992). In the summer of 1992, Starbucks modified their logo to the very famous version with a Siren with no belly button or bottom half, and the words “Starbucks Coffee” around the logo. From 1987 to 1992 (before when the company went public), the logo was a green complete Siren, showing off both her tails, and her belly button. 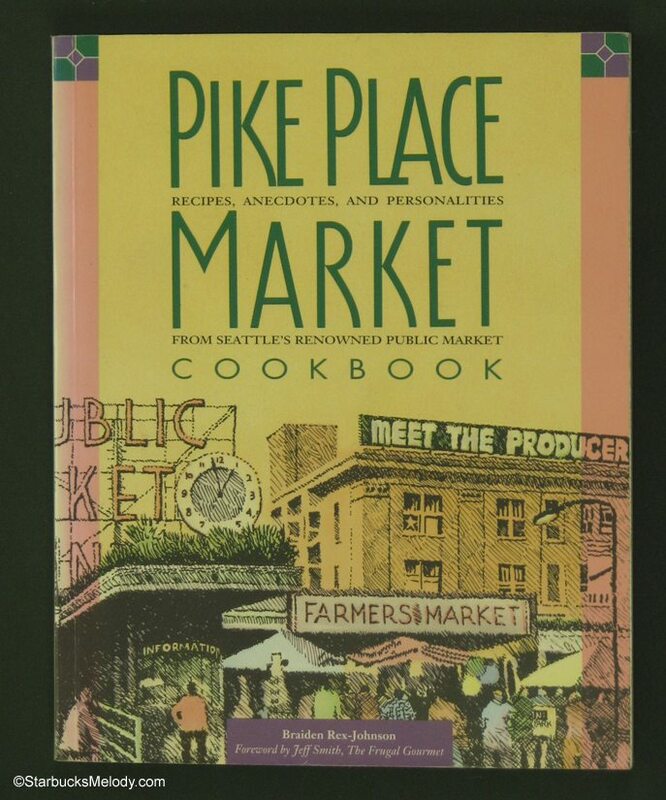 The Pike Place Market Cookbook in this article is copy-righted 1992, though given that the version of the logo shown dates before 1992, I would assume that they started working on the copy for this book in 1991. 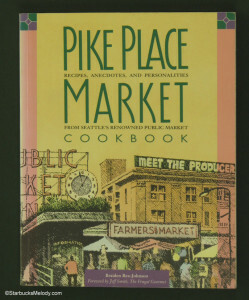 This cookbook features a series of recipes, and stories about the businesses at Seattle’s Pike Place Market. 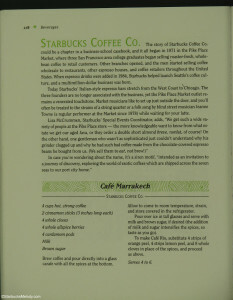 I read through the two pages on Starbucks and enjoyed the short piece about the 1912 Pike Place Starbucks. 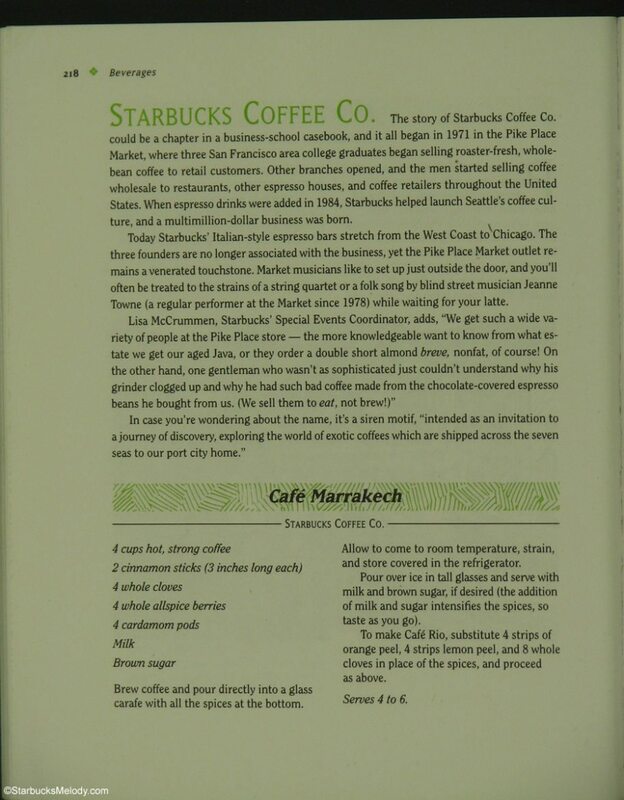 It’s just funny to read that Starbucks’ espresso bars “stretch from the West Coast to Chicago.” As I mentioned, it’s hard to think about Starbucks ever being that small at one time! 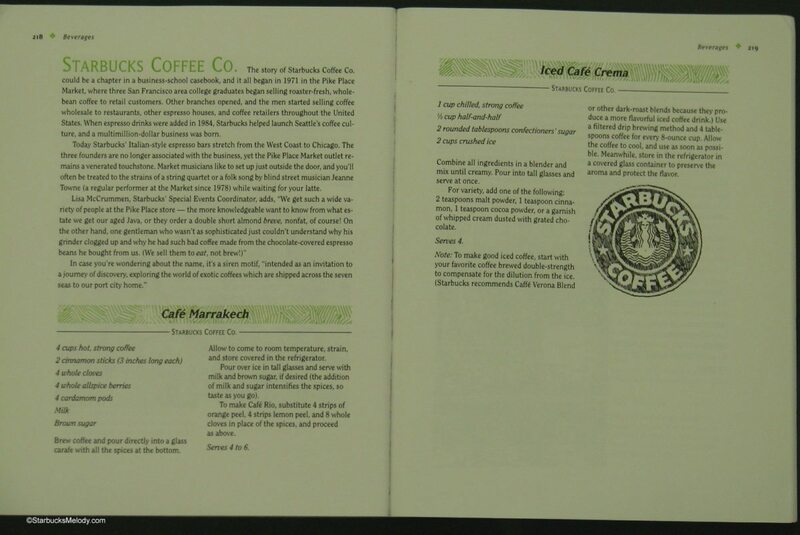 The story of Starbucks Coffee Co. could be a chapter in a business-school casebook, and it all began in 1971, in the Pike Place Market, where three San Francisco area college graduates began selling roaster-fresh, whole bean coffee to retail customers. Other branches opened, and the men started selling coffee whole to restaurants, other espresso houses, and coffee retailers throughout the United States. When espresso drinks were added in 1984, Starbucks helped launch Seattle’s coffee culture, and a multimillion dollar business was born. Today Starbucks’ Italian-style espresso bars stretch from the West Coast to Chicago. The three founders are no longer associated with the business, yet the Pike Place Market outlet remains a venerated touchstone. Market musicians like to set up just outside the door, and you’ll often be treated to a string quartet or a folk song sung by blind street musician Jeanne Towne (a regular performer at the Market since 1978) while waiting for your latte. 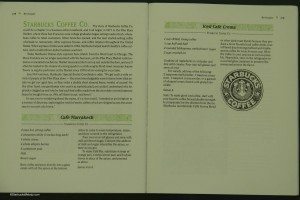 Notice that after the Starbucks story, there’s a recipe for iced coffee. If you try it, let me know! It looks like a pretty exotic iced coffee. The LCD screen at Starbucks: A tribute to the disappearing “Now Playing” screen. that iced coffee sounds delicious! Oh my gosh to see how far the Iced Cafe Crema has come. It sounds like that’s the Grandfather of the what is now called the “world famous” Frappuccino Blended Coffee. Right? Hahahaha. Melody these little gems are fantastic. I haven’t thought about that book in forever! Thanks for brushing off the dust and posting it. Hahahaha. Awesome! I’m glad several people are trying the iced coffee recipe! Patrick, glad you like this little moments of Starbucks long ago! I really liked the story of the guy who put chocolate covered espresso beans in his grinder, and tried to brew them! hahaha! What a cool piece of Starbucks history! I’ve got one bag of Kati Kati Blend left and I have to try it in the Cafe Rio recipe. Thank you so much for posting this. I love the bit about stores from the West Coast to Chicago. It’s crazy to think that we didn’t have Starbucks here in FL twenty years ago! I’m also curious about that iced coffee. I’ll have to remember to pick up the ingredients to make it. It is wild to think about how quickly the company expanded in the mid 90s/early 2000s. Even though the recession dealt Starbucks a few setbacks, I do believe that it taught us valuable lessons in efficiency and continuing to deliver quality beverages and food options. Actually Starbucks was a corporation before their IPO in 1992. 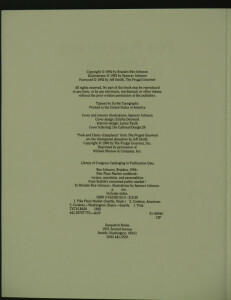 When Starbucks and Il Giornale consolidated in 1987, the resulting company was “Starbucks Corporation”. Starbucks also had a stock option program while they were still privately owned. So they were a corporation, just not publicly traded.